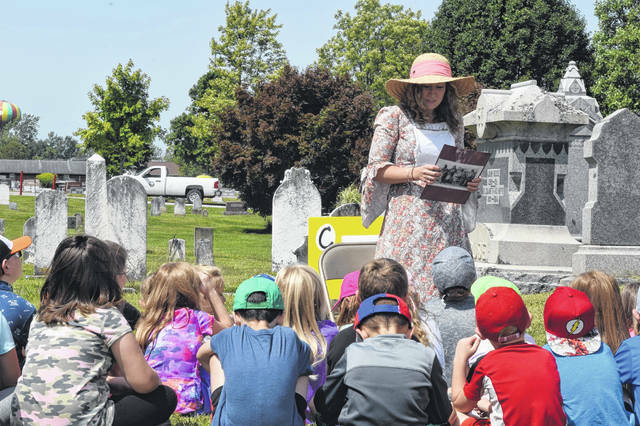 The TCNES Cemetery Walk took place on Friday, Aug. 24, bringing together community members to teach TCN students about the founders of the village. 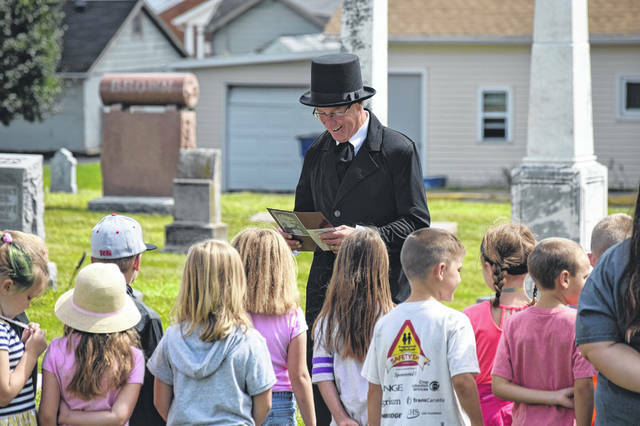 LEWISBURG — Many important figures from Lewisburg’s early history have been buried in Roselawn Cemetery. 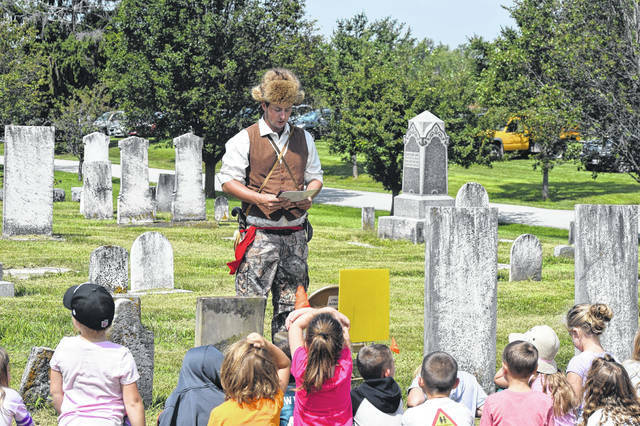 As a way to teach the students of Tri-County North Elementary School (TCNES) a little more about their village’s history — and as a way to celebrate the village’s upcoming bicentennial — several volunteers dressed as those figures to share a little history in a fun way. Librarian Rachel Davidson worked for a year and a half to gather information on historical figures in the area. 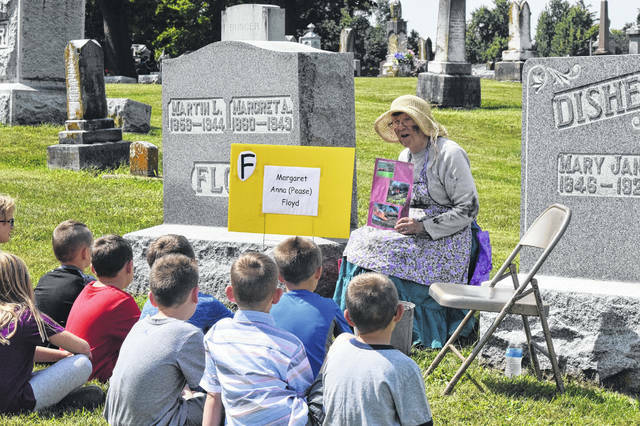 “Two years ago, my cousin, Abby Kring, arranged for our families to go on a cemetery walk in Dayton. People dressed up as some of the people buried there and told their story. Afterwards, my aunt and I were talking and I told her it was a shame that we didn’t do something like this for our cemetery in our little town and that even little ole Lewisburg had to have some people of interest. After a year and a half of research, and with the help of Angie Getter and the staff at Preble County Genealogy Library, the walk began,” Davidson said. 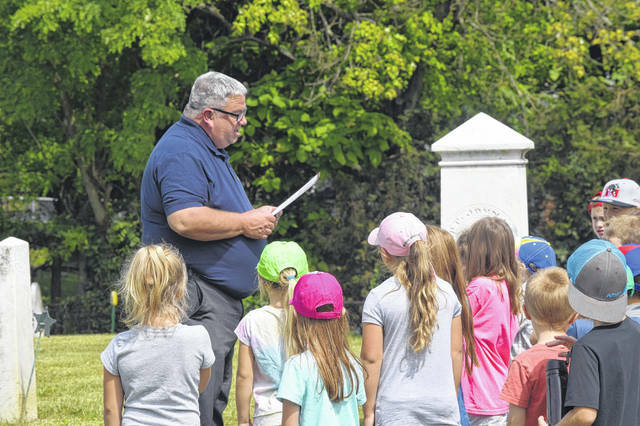 “Eighteen volunteers played the part of people buried there who represented some of the history of Lewisburg. 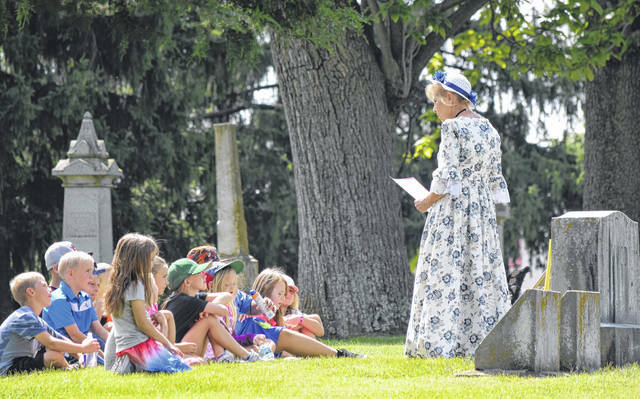 The tour acquainted students with some of the cemetery’s earliest residents, as they shared brief accounts of their lives and contributions to Lewisburg and Ohio. According to Davidson, while on the tour students learned about Henry Horn who platted Lewisburg, Joseph Singer who was probably the first settler, Granville Kumler who was mayor, State Senator, and editor of The Lewisburg Leader; Rebecca Sharp whoo was kidnapped by Indians, and Martin Gates, who pushed for sidewalks in Lewisburg and received the first telegraph. Maud Tilman has a unique gravestone shaped like a tree stump, meaning her life was cut too short. Charles Cox was an up- and-coming race car driver in the 1930s who died in a crash during a race, while the person causing the crash went on to win the race. After hearing each presentation, students placed a flower on the headstone in honor of that person. “If we make learning fun, they will remember it. I want to make some positive memories for our students, while they learn that even they have a story to tell,” she said. “I wanted students to hear the triumphs and tragedies of people in our community, right here where they live. “We all have a story, and being the librarian, I wanted to make stories come alive for them. When I started this I didn’t realize that Lewisburg’s bicentennial was coming up. It all just seemed to come together and made the perfect opportunity to promote the 200th celebration and get students excited about history. This is the second time the walk was attempted. A previous effort was made, but cancelled due to rain. Davidson added, “[I] would like to thank Angie Getter and the staff at the Preble County Genealogy Library in Eaton that helped with the research. A huge thank you to the volunteers who took time out of their day to play a part while maintaining the dignity of the person they were portraying. They are: Alice Rayburg, Barb Hake,, David Steck, Joyann Scott, Kaylee Lebo, Nancy Tilton, Christy Milhouse, Mark Madigan, Logan Justis, Sharon Justis, Angie Getter, Abby Kring, Alan & Sheila DeMotte, Angela Cherry, Del and Jeff Sewert, Everett Trittschuh, Pam Baker, and Eli Davidson. 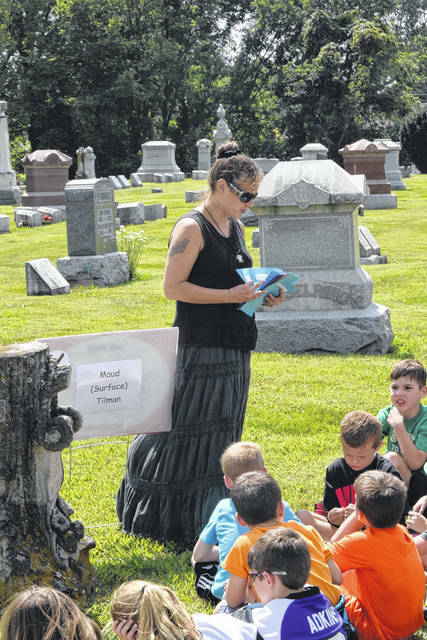 https://www.registerherald.com/wp-content/uploads/sites/41/2018/08/web1_Cemetery7.jpgThe TCNES Cemetery Walk took place on Friday, Aug. 24, bringing together community members to teach TCN students about the founders of the village.